International and local transport has grown considerably due to globalization and internationalization. There has been a global increase in dependency on commodities manufactured from low wage countries such as China, India, Africa and Asian nations. This has driven the demand for better shipment. The invention of containership by Malcom Mclean’s in 1956 was perhaps the most important innovation in the transport sector. Bulk and sensitive commodities are packed and sealed in strong durable steel or aluminum boxes. These were then loaded on trucks, ships and trains for transportation. The shape of the container allows easy stacking on top of each other. Since they are manufactured from high strength materials and locked, they are intrusion free. They also have identification number allowing for easy tracking via GPS and RFID. Standard containers are manufactured from steel or aluminum. Their shape, sizes are standardized to allow easy handling and transport. Steel containers are 20, 30 or 40 feet long, width of 7 and 8 ft and 8, 8 ½ and 9 feet high. The side and end walls are manufactured from paneled sheets. The frame is specially designed to withstand weight of other stacked containers on top. One end has door hinges, panels and locking bars. Aluminum types are made of steel frames while the sides, front, back, roof and bottom are made with high strength durable aluminum. The container manufacture process utilizes a great deal of sheet metal machinery. First they are cut to their specific dimensions using the shearing machine. This device is sturdy and has the capability of cutting heavy gauge plates in a guillotine manner. Square, rectangular and round grooves are then made on the flat materials using a specially designed heavy duty press brake. 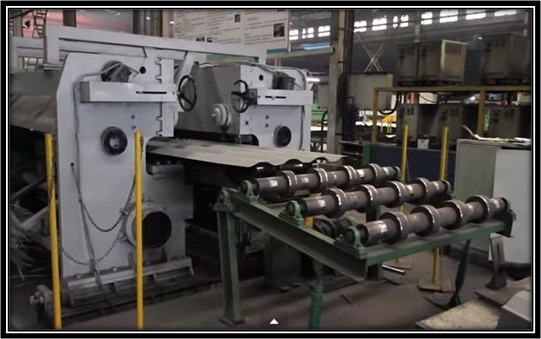 The machine is fed with material and it forms the square corrugations. The roof panels are made pressing using a specially designed press brake machine. This device punch presses the plate against the die to form the intended shape. The floor frame is then made by cutting the plate using a shearing machine and these are folded using a press brake machine. This machine folds the material forming a U shaped bracket. A series of these brackets are welded to form a very strong base. The door, sides and other parts are also fabricated by cutting the plates and square tubes using shearing equipment, folding the sheets using press brake and welding the parts. Fastening holes are also drilled on all parts. The containers must be made from good quality materials that don’t rust or corrode when exposed to harsh sea environment. The joints and other parts must be properly sealed to protect the commodities being transported. The container market has continued to grow rapidly. In 2012, the global container fleet was 32.9 million TEU and 34.5 million TEU in 2013. This growth is expected to continue due to their global acceptance and high demand. Why Sheet Metal Machinery is Considered as one of the Best Machine Tools? This entry was posted in Sheet Metal Machinery, Sheet Metal Machines by Yash Shah. Bookmark the permalink.